Share your first day photos with us! For the 2018-19 school year, we are inviting Solvay Union Free School District students, staff, and families to consider sharing their first day of school photos with us. We have even made a sign for you to use! Printed copies of the sign may be picked up at the district office and each of the school main offices. 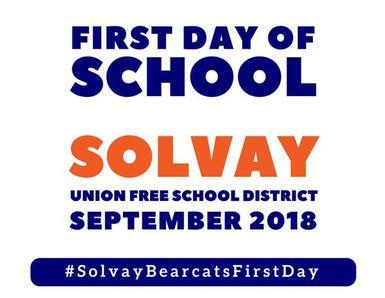 Photos can be shared with us through Facebook (@SolvaySchools), Twitter (@SolvaySchools), email, or by using the hashtag #SolvayBearcatsFirstDay. We can’t wait to see how you plan to celebrate the start of the 2018-19 school year! Please note that by submitting your photos, you allow the Solvay UFSD to use and display them online. When submitting photos on social media, please be sure to avoid using any identifiers like names and house numbers. Download the sign by clicking here.